A familiar pattern is developing this week; yesterday once again the weather was overcast and misty. It was obvious from early on that it would not clear so our exercise was a good long walk from Yellow Craig Plantation along Broad Sands to North Berwick and back. 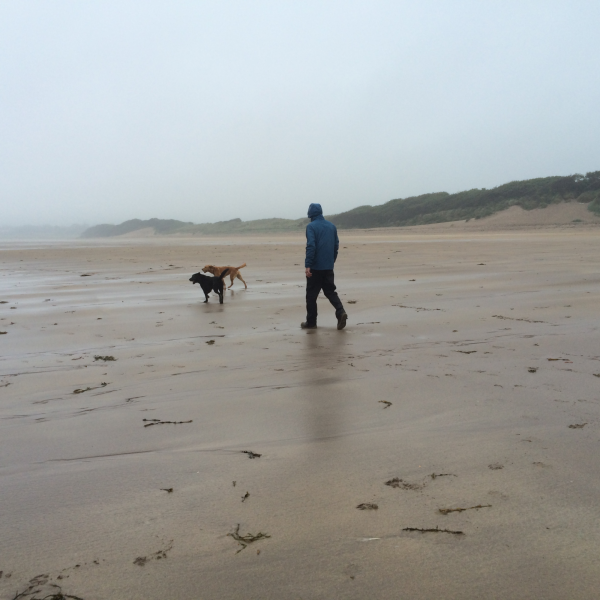 The dogs were not at all bothered by the poor visibility, the drizzle or the chill to the air, as far as they were concerned it was a perfect walk. 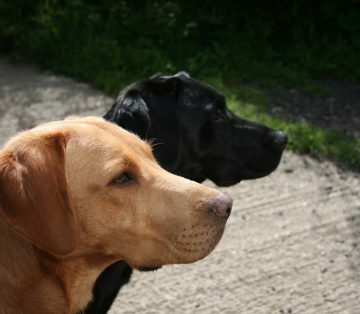 Thankfully today the cloud has lifted and it looks promising for a bit of hill walking. 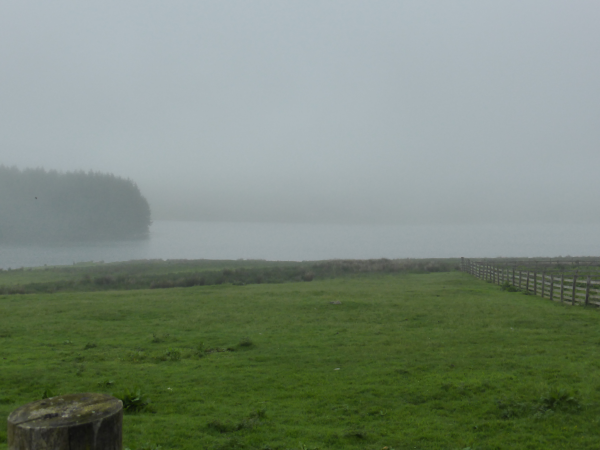 Earlier in the week poor visibility made us abandon plans to do a walk from Whiteadder Reservoir so that’s where we are heading today. We follow the B6355 out of Gifford and park in a small parking area just the other side of the causeway over the reservoir. 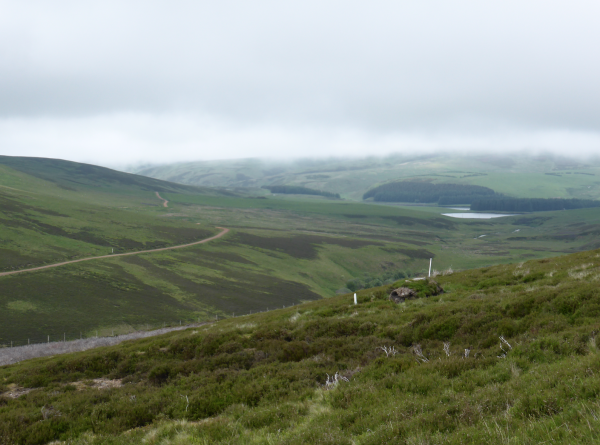 Our walk starts by going back up the road and after a cattle grid taking a tarmac track on the left that heads to the western edge of the reservoir. Just before a bridge we turn right to follow a track towards a cottage (Penshiel) and continue on this track as it passes the cottage and climbs gradually. 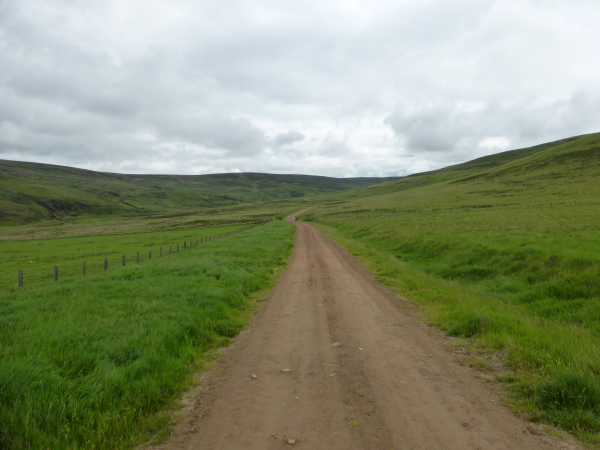 We are now on the Herring Road, an ancient, 28-mile route, crossing the Lammermuir Hills. Fishwives carrying creels of herrings from the port at Dunbar to the market at Lauder used it in the 18th, 19th and 20th centuries. It must have been hard graft. I have recently been reading about Amazon’s plans to make deliveries to householders by drone. I find it difficult to comprehend the technology involved, but imagine walking a few miles with a group of those fishwives trying to explain such stuff to them. 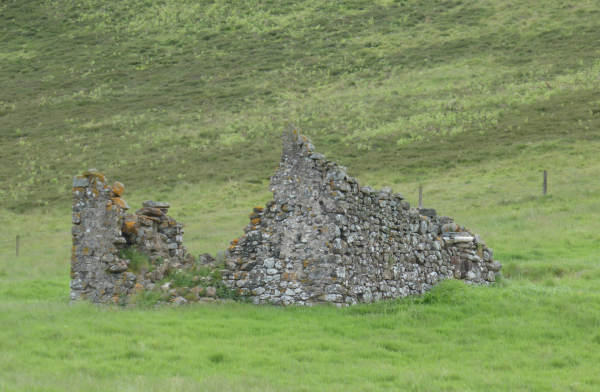 About half a mile along the track we see the remains of Penshiel Grange built in the 15th century. It was a monastic grange, which was an outlying farming estate belonging to the monastery. 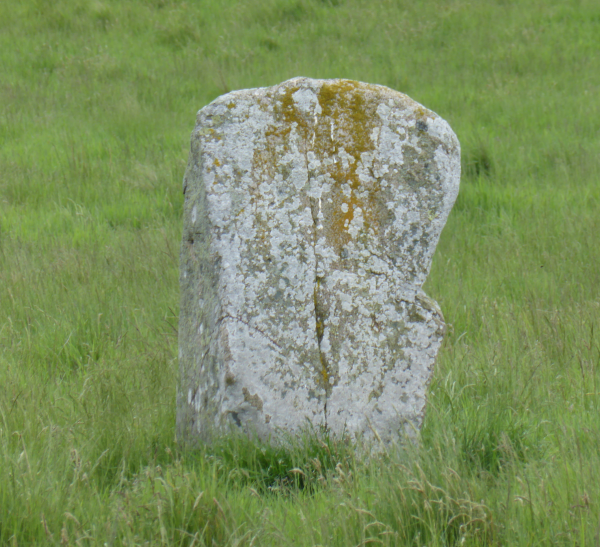 Little of the building is left but on the right hand side of the track we spot a standing stone known as the Chapel Stone. 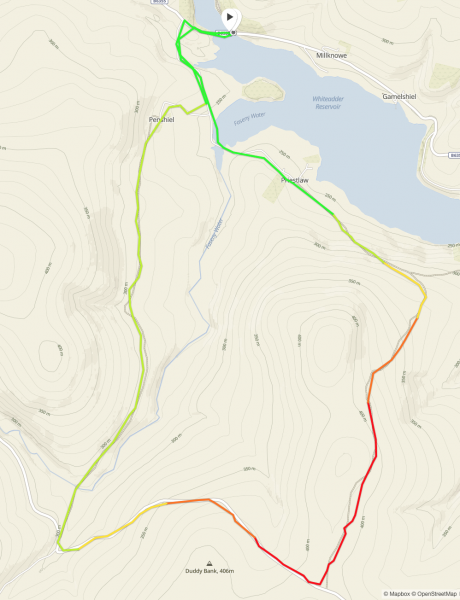 The route is now straightforward and follows the track with Faseny Water to our left. 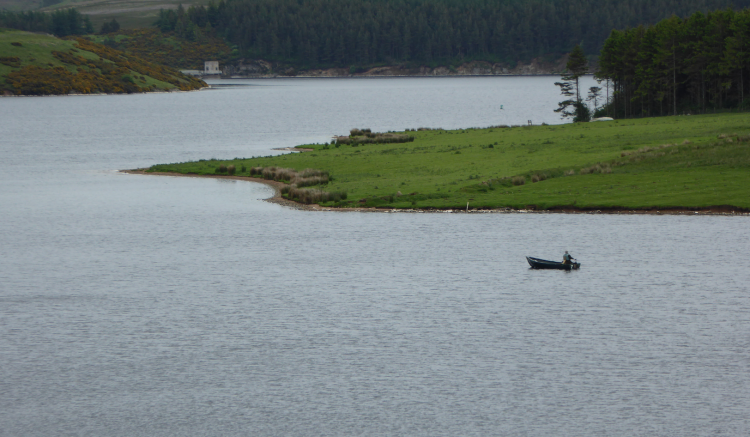 After crossing Faseny Water we reach a minor road and turn left to climb up hill. There is a cracking view down through the valley of the route we have just followed. More concerning is the view behind us where in the distance the clouds are beginning to descend. However, knowing that if we do encounter poor visibility we could turn and easily retrace our route back we decide to keep heading up. The climb up the hill is gradual though steep in parts and despite the cloud in the distance it is warm going. As the road levels at the top we take a clear track on the left towards Priestlaw Hill. 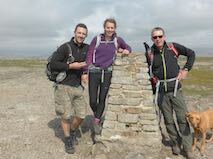 The broad track is easy to follow, we had intended diverting from it to reach the top of Priestlaw Hill. 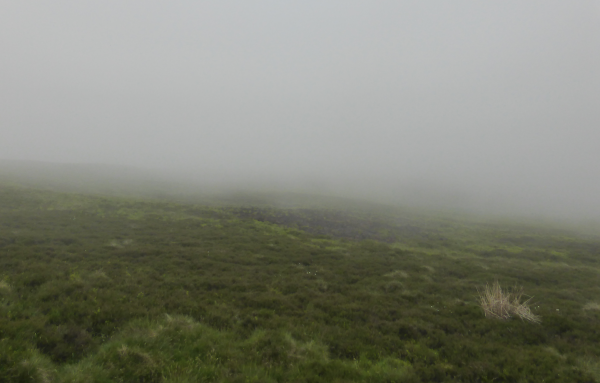 But we are now enveloped in cloud and the visibility is getting worse by the minute, so we continue on the track skirting the summit. 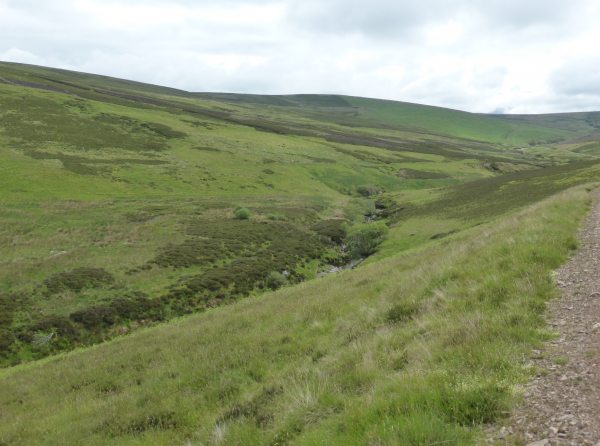 There are occasional tracks leading off, but we follow the main track as it starts to descend toward Whiteadder Reservoir. It is a bit eerie, we know the water is down below us but the poor visibility means that we don’t get the anticipated views and can’t see the reservoir until we are almost at Priestlaw where we go through a couple of gates. After going through the farmyard we pick up the tarmac drive leading back past the reservoir, it is amazing how different it looks from a few hours earlier. On reaching the B6355 we turn right to reach the car. Our walk has covered almost six and a half miles; despite the poor visibility in the latter stages it has been thoroughly enjoyable. We plan to return here when we visit the area again, I fancy seeing the views from the top of Priestlaw Hill on a clear day.